Combine the black beans, zucchini, onion, yellow squash, mushrooms, cumin, chili powder, water, and lime juice together in a pot on your stove. Cook for about 15 minutes. Add the spinach, green onions, green bell pepper, garlic cloves, cilantro, avocado, water, and lime juice to your Vitamix, food processor, or blender and blend until smooth. Add a few spoonfuls of the green sauce to the bottom of a baking dish. Spoon the enchilada filling into each tortilla and roll up. Add to the baking dish. When all six tortillas are in the dish, pour more of the greens sauce over the top. You should have about 1 cup leftover of the sauce. Bake at 375 degrees covered for 30 minutes, then uncovered for another 15 minutes. Pour the remaining green sauce back into your Vitamix, food processor, or blender, and add in the cashews, nutritional yeast, apple cider vinegar, and water and blend until smooth. 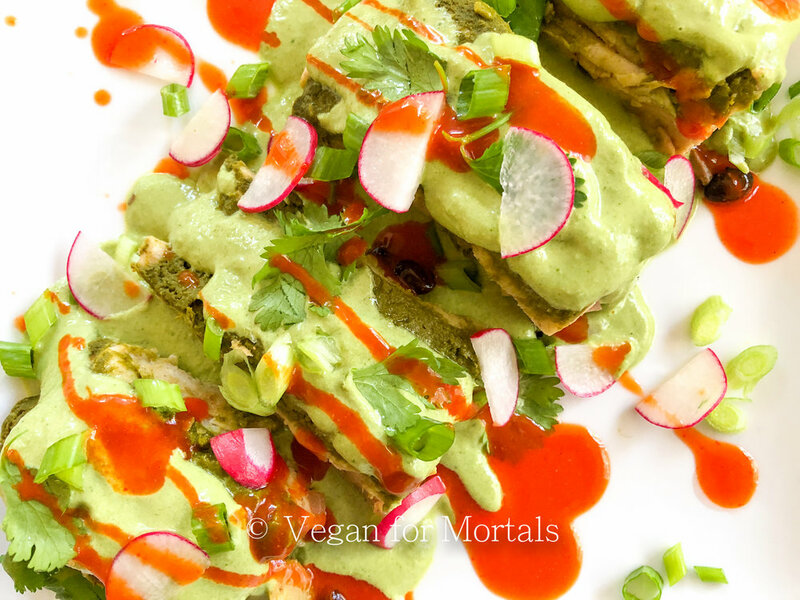 When the enchilada are done baking spoon the cashew creama over the top and sprinkle the sliced radishes, cilantro and green onions over the top. Drizzle on any hot sauce to taste!